Hi, I need some advice on how to proceed after discovering a problem. My contractor is doing a tear out and replacement of a tile shower. It's located in a small bathroom that was an add in in the corner of an old house. The roof pitch only allows for the ceiling to be 78" high. After doing some research I decided that I wanted to use the Kerdi system. My contractor who has done some other projects for us hadn't used it before, but he had no problem going with it. I spoke with the Daltile store and they recommended a good modified thinset under the Kerdi pan and had Laticrete 317 unmodified available for the rest of the job. My contractor went and picked up the shower and materials. He used hardibacker on the walls. After coming home from work and looking things over I'm pretty sure they used TEC skill set unmodified under the pan because they had a couple of bags of that in the rooms, one of which was half empty. Over the next couple of days they hung the membrane. When I went in to look it over this weekend I noticed a bucket of mastic sitting on the shower floor. About a third of the bucket has been used. Hardly any of the Laticrete has been used. From what I can tell they opened the bag before they started the job and haven't used any since. I tried to find info on the TEC skill set, but didn't come across much. I looks like it's about $6 a bag. I don't know how much or where the TEC and mastic were used on the walls. 1. Can I Redguard over the Kerdi to prevent water getting to the mastic or should I consider aborting at this time? If they used mastic on the floor sheet is it hopeless to try the Redgaurd? 2. They stopped the Kerdi about 3/4 inch from the ceiling, and there is a gap there in places between the wall and ceiling. If we finish the job should I run the Kerdi up onto the ceiling? I'm worried about water getting in since the ceiling is so low. You need to tell us which TEC unmodified mortar you have. They make several under the Skill Set line, I think. That said, the use of the unmodified mortar to set the foam shower tray is acceptable under the Schluter guidelines. Use of a very cheap unmodified should be avoided. The Laticrete 317 would have been fine for that application. The use of the organic adhesive (mastic) to install the Kerdi is not acceptable to either the membrane manufacturer or the adhesive manufacturer. At the overlaps of the membrane you'll not have what the manufacturers require for the installation to be waterproof. Did your contractor read the installation instructions for the Kerdi Shower System before he took on the unfamiliar task, do you suppose? 1. I would abort and find an installer who was willing to follow the product manufacturer's installation instructions or do the installation yourself. We'll hope you've not paid much for this attempt thus far. 2. With a ceiling that low I'd be inclined to waterproof the ceiling as well as the shower walls. This is a flat ceiling at only 78 inches? Thanks for the reply. The bag of TEC skill set is unmodified Floor Mortar. I misspoke about the Laticrete. I just took a better look and over half the bag has been used. I'll give the contractor a call and ask what was used where. Yes the ceiling is flat. Another question. The curb is Kerdi Foam. Can I fix shower door frames or pivots to it? Maybe I'm not looking in the right place, but I haven't found much information about that. JD, technically, I'm not sure but I wouldn't use a pivot hinge on any shower door installation, regardless of the curb. I like the hinges to be mounted to the jamb with long enough screws to reach the wood. Probably wouldn't be a bad idea to peel off a corner of the Kerdi and look at the adhesive underneath. If it's still wet it's definitely the mastic and needs to be torn out. Mastic over Hardibacker would likely dry... It's the overlaps that would stay wet. If it is Mastic, I'd tear it out and start over. I'm wondering how well the mastic, even over Hardibacker, would engage with the Kerdi fleece. If they did in fact use mastic, that's a huge no-no, and I'd scrap the Kerdi, Hardibacker, and the installer and start over. Agreed.. I was just saying it would be unlikely to see wet mastic when Kerdi is peeled off Hardi. Mastic does not belong anywhere near Kerdi. Thanks everyone for the input. I spoke with the contractor. He swears they didn't use any mastic. But the middle of the shower was a strange place to set the bucket if he wasn't using it there. When I look at it most of the membrane edges are covered in gray sandy mortar. It looks like thin-set. The corners and some overlap areas have a lighter gray around the edges. It is still sandy looking, but definitely a bit lighter in color. So I think the floor and walls are probably thin-set under the Kerdi, but the corners and overlaps may be some mastic or maybe the thin-set was modified? I really hate to start over. Given that the large Kerdi sheets are adhered with thin-set can I get away with RedGaurding the overlaps and corners? A number of pictures would really help us make that determination. I can think of a couple of possibilities for the bucket being where it is. I've been known to use buckets as stools and also as weights. In this case perhaps it was weighting drain? Like Paul said, photos would help. Update. After talking to my contractor I became convinced that they hadn't used any mastic. I put some kerdi up to cover where the wall and ceiling joined (It seemed pretty easy to work with). So then I decided to do a leak test since they were going to tile the pan on Monday. I let the water sit in for 12 hours and there didn't seem to be any loss. I pulled the plug and thought everything was great, but when I looked it over again there seemed to be wet spots under the liner by the drain, and in one area close to the curb. There is also a white band around the kerdi now where the water level was. Could this be mastic? Or is it just some other residue from the pan? The bottom photo is what things looked like prior to the test. Sorry for the multiple posts. A couple of hours since I took the photos the area around the drain looks dry now. It's hard to tell with the small area by the curb. that outside corner looks funny...what is going on there? is it flipped backwards? the white line may just be residue bleached out of the thinset. wet near the drain? ...the membrane needs to be bonded to the drain and rubbed together really well to leave a very thin layer of thinset..just like the walls ..it is not good if the thinset in between the two that is too thick. might want to check that. It is really hard to tell if you will have a problem with out actually being there. and even then it would be hard to tell how much overlap etc..he has with all that thinset smeared everywhere. One thing for sure though is that it is his first job and looks like it too. The tec thinset I have used was very sandy and would barely hold Kerdi (can I use the word Crap? )...if he used the stuff im thinking of and got the Kerdi to stick..then he is a better man then me...though judging from that outside corner...maybe not. I would suggest at this point to get someone to go over it very carefully making sure everything is stuck and removing corner pieces especially near the floor if need be to make sure you have proper overlap and everything is bonded, the Tec should scrap right off easily..remove every bit of it..then re-apply with a much better quality thinset like Ditra-set. 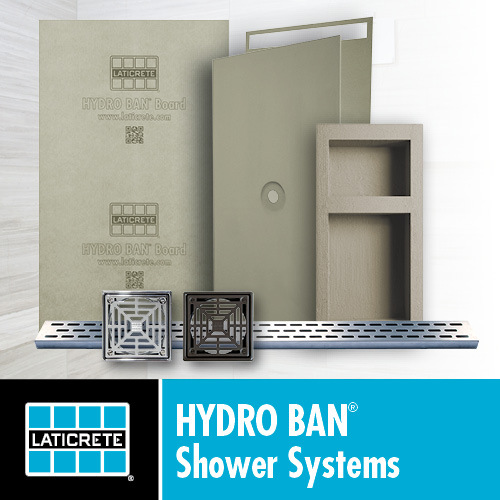 Schluter on requires that in non-steam applications such as yours that the membrane go above the shower head..